Llewellyn has a huge affinity with the wolf. In Celtic tradition the wolf represents family, loyalty, and protection. Moon is the power energy of the wolf and the best phases are the full moon, and twilight. Wolf Lore teaches us about our deepest selves and finding great courage and strength in difficult times. Wolf symbolizes wisdom, freedom,intuition, dreams and magick. 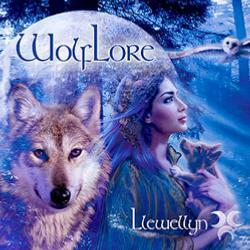 Through this celebratory music, Llewellyn invites us on a journey with the wolves. An uplifting musical journey of rebirth to search the wild self within, find new lifepaths, and allow ourselves to literally howl. Instrumentation includes Celtic flutes, Native Indian flutes, Skin drums, acoustic guitar, piano, keyboards,and natural sound recordings of wolves.